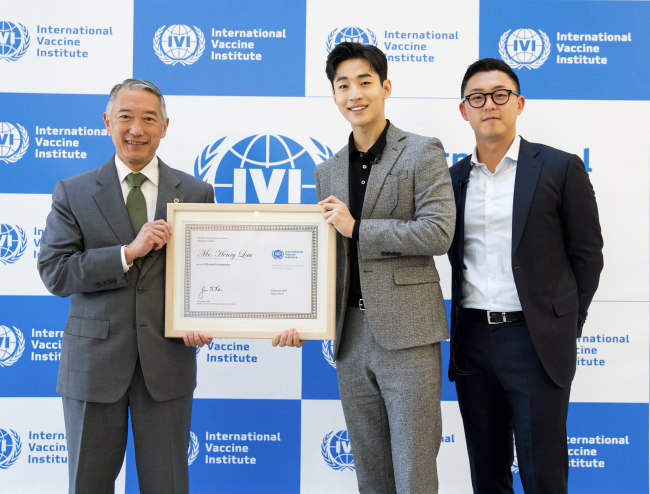 Singer-actor Henry Lau, better known as Henry, was named a Goodwill Ambassador for the International Vaccine Institute at a ceremony at the IVI’s headquarters in Seoul on Tuesday. Founded by the UN Development Programme in 1997, IVI is an independent international organization that works on vaccine development, with a focus on creating awareness about the importance of vaccines among the general public, especially in low-income developing countries. Henry became familiar with IVI’s mission years ago when his longtime high school friend Justin Im started working as a researcher for the institute. “I’m excited to be part of IVI’s global mission and I will do my best to spread awareness of life-saving vaccines in order to help vulnerable children all over the world,” Henry said.